Created by UK Brand Vampire Vape, Koncept XIX is a shortfill range featuring 12 flavours. Each e-liquid bottle contains 50ml of e-liquid with space to add an additional nicotine shot. 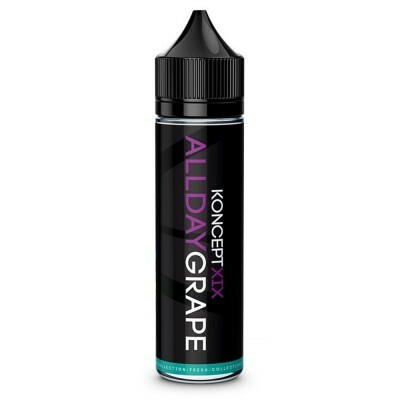 Koncept XIX is a VG heavy range, with a VG:PG range of 80:20. This makes them ideal for cloud vaping and direct-to-lung inhaling. VG heavy juices are best used with high powered devices and low resistance coils designed for high VG juices. For a lower VG ratio check out the original Vampire Vape 10ml range or Vampire Vape Nicotine Salts. For the original range, Vampire Vapes has chosen 3 of its most popular flavours from their 10ml range. Heisenberg: One of the UK’s most popular flavours, combining fruit with a cool menthol blast. PinkMan: Mixed fruit with citrus notes and a secret ingredient known only to the manufacturer. Blood Sukka: Captures the taste of the red berries that give the flavour its name with sweet eucalyptus and finished off with aniseed for a bite appropriate for a brand named after Vampires. The Baked collection features traditional baked dessert flavours, many of them reminiscent of childhood treats. Phat Drizzle: Freshly baked warm vanilla sponge cake drizzled with a generous portion of sweet caramel. Pie Eyed: Freshly baked flaky pastry with a sweet lemon tang. Poley Rolly: Traditional dessert flavour featuring sweet jam roll covered with a rich yellow custard. Tika Taka: Fresh oranges with some real fizz added! All Day Grape: Freshly picked and pressed purple grapes. Kool Kick: Lemon combined with the trademark coolness of the Vampire Vape range. Sticky Spot: Fresh strawberries covered with sticky toffee. Golden Thrill: A fruity vape based on sweet mango. Get Cubed: Sweet cola with extra fizz!